The time has come to bring a bit of colour to your garden – and hanging baskets can be one of the prettiest ways to brighten up a drab area. 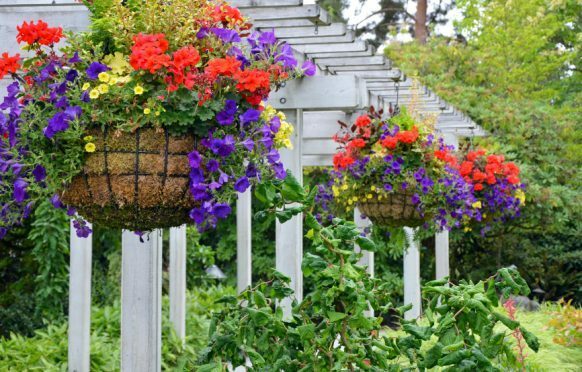 Trying to find a spare bit of space for a large planter can be difficult for many of us, but hanging baskets solve that problem. Whether attached to a free-standing holder or a wall-mounted bracket, the baskets take up less ground space while still bringing vibrancy to the area. Hanging baskets can also be at various heights so you can have fantastic floral displays at all levels. With Dobbies’ handy guide to do hanging baskets, you can mix and match lush foliage with big blooms and delicate flowers and create displays that really wow any visitors to your home. Once you have everything you need, just follow these simple steps and you will have a garden full of beautiful baskets in no time. Sit your hanging basket (with the liner inside) on top of an empty plant pot (to hold it steady) and fill it half-full with compost. Add in the fertiliser and water-retaining gel, following the instructions on the packets and use your hands to mix them into the compost. Cut six evenly-spaced holes into the liner, just above the compost level and push one plant through each hole, taking care not to damage them. Add in some more compost, filling the gaps between the plants. Add the remaining plants to the top, with one in the centre. Water the basket every day (and do it twice a day on very hote days), making sure the compost never dries out. As the blooms die out, remove them to encourage the plants to produce more flowers and extend the overall life of the basket. For more top gardening tips, visit the Dobbies website. SPONSORED: Be Smart with your lawn this autumn!